They’re big and made of metal. “Made of metal” is a pretty important criterion for robothood. I’d like to argue that there’s another essential requirement, though: robots are made. Maybe by people. Maybe by other robots. To be a robot, you must have been manufactured and programmed by another being. I’ve made my love of James Roberts’s Transformers: More Than Meets the Eye no secret. I’d like to argue that beings from Cybertron - Transformers - are potentially not robots but metal aliens. 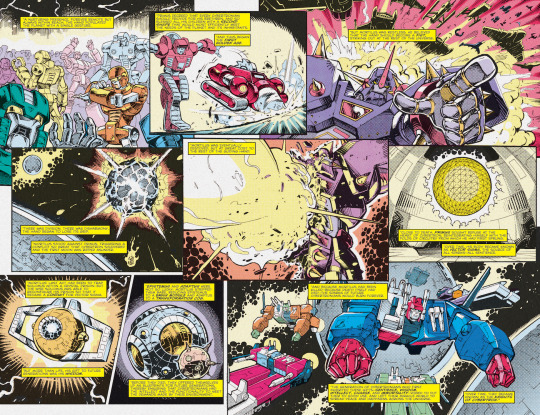 (At least the Transformers as depicted in IDW’s comics.) The difference being that Cybertronians were not built by anyone; their life cycle is a natural process. What do we know about how Cybertronians are born? Active sparks are then harvested from a hot spot and placed inside sentio metallico - the living metal Cybertron is made of - which grows into a full-sized adult. 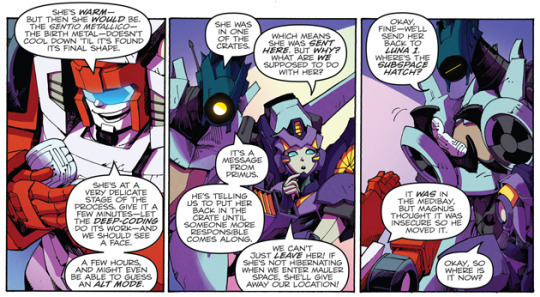 MTMtE 21 establishes that maturation can take as little as two weeks. Once grown the spark is essentially a Cybertronian’s heart and is one of his1 major organs (the others being the brain and the transformation cog, which collectively are known as “Rossum’s Trinity”3). 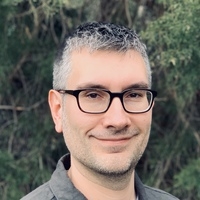 Since sparks occur naturally, and since the process of creating their bodies is that of a natural germination between the spark and the sentio metallico, I argue that they are living alien beings who happen to be made of metal, not robots that are created and programmed. 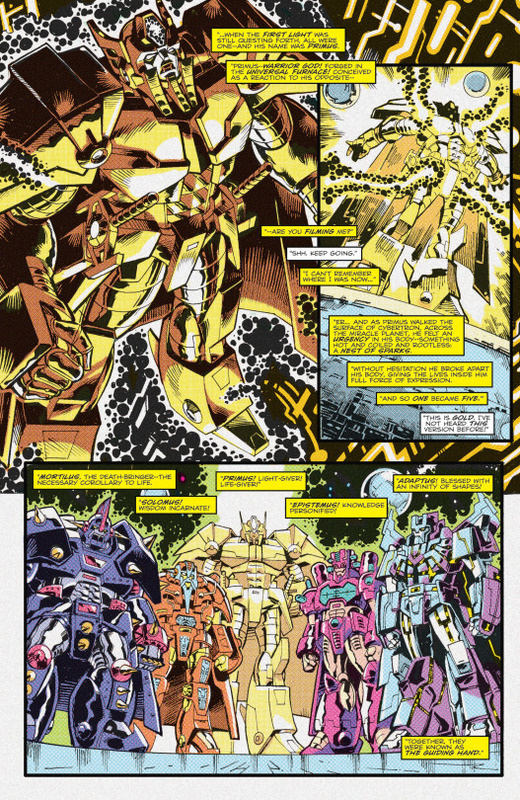 A wrinkle: More Than Meets the Eye establishes that there are two kinds of Cybertronians: those that are “forged” and those that are “constructed cold.” Forged Cybertronians are born as described above: a spark is harvested from a hot spot and placed into living metal, which grows into a living, thinking being. 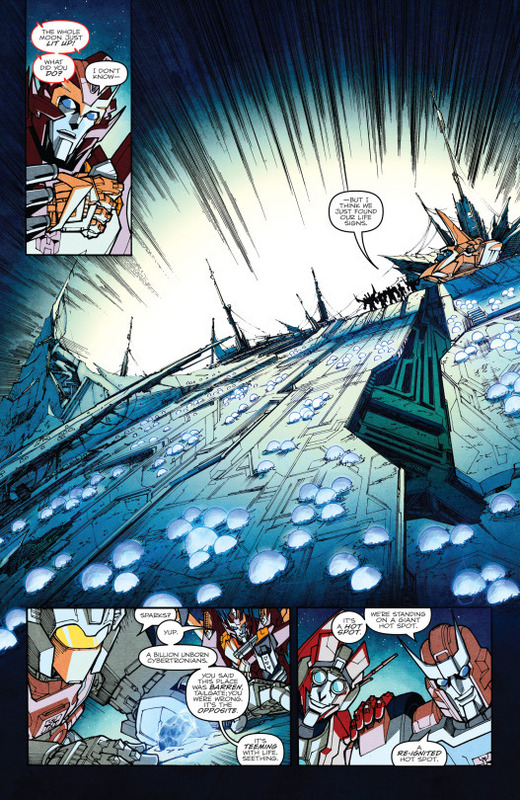 Cybertronians that are “constructed cold” came about because pulse waves from Vector Sigma slowed down and fewer and fewer hot spots were coming alive, so they learned how to split sparks and place them in pre-constructed bodies. Those who were constructed cold were treated as second-class citizens or, often, disposable soldiers and their culture saw massive segregation between the two types. That period of their history is over but it’s still inappropriate to ask someone the method of their construction. 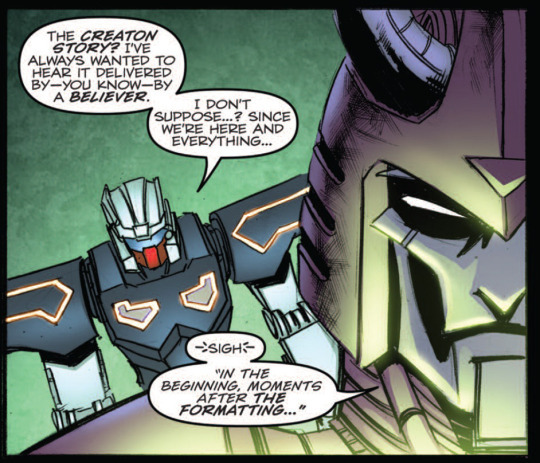 I’ll cede that a constructed cold Cybertronian may be a robot but it’d be super racist to say that to his face. Cybertronians are genderless2. We use male pronouns for expediency. Their romances do read as gay, but that’s our bias. Well, except for the female ones… because of course there’s a storyline where someone experimented on them and made females.